Brian Rubin: Thank you for taking the time to answer these questions. First off, could you please tell us a little about yourself, your gaming background and if applicable, your gaming creation background before HES. Dave Toulouse: My name is Dave Toulouse and I’m a part-time indie. At day I’m a programmer analyst and at night and on the weekend I’m working on games which one day will hopefully become a full-time job. I started in 2007 and my first game was an MMO named Golemizer. The game is unfortunately now offline as it was some crazy project as a first attempt but it was also a huge learning opportunity. I then worked on 2 more MMOs on my own before working on smaller Flash games. Last year I released my first solid downloadable game: Bret Airborne which is a puzzle game combining RPG elements. As for my gaming background I’ve been a PC gamer since the age of 11 and never possessed any console. Since I mostly enjoy strategy games and RPGs I guess the PC had everything I needed. Now that I make games I have a lot less time to play but still try to find some time to check anything strategy or space related. BR: Now where did the idea or inspiration for HES come from, and how did you get it off the ground, so to speak? DT: The seed that became HES was a prototype of a top-view space game with stealth elements. Something likes a smuggler game in which the goal was to carefully maneuver the ship to complete each missions. The prototype got nowhere but I then approached in a different way my goal of making a space game in which maneuvers actually mattered. 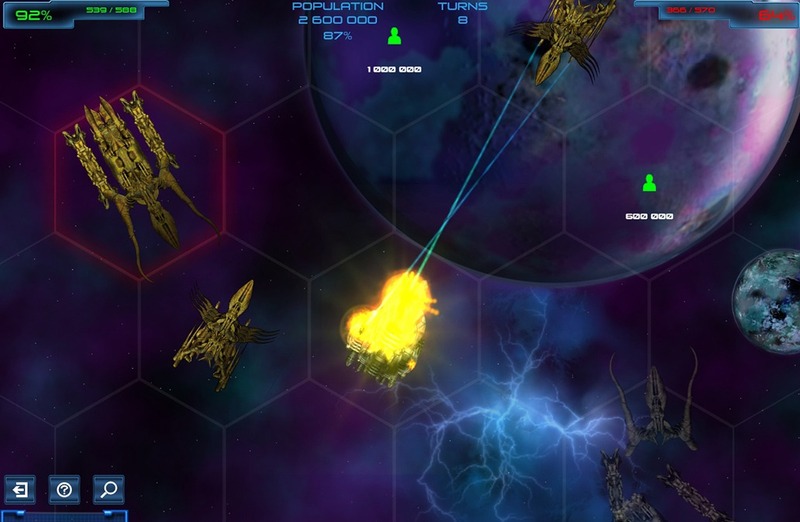 In most space game combat is often just a matter of “get in range and then align your ship to fire”. What I wanted to create was a game in which you have to plan a bit more your attacks. That’s when I thought of using a hex grid and going for something that could be compared to chess a bit. By setting specific patterns for the movement of ships and which tiles a weapon can reach I then had the answer to what I was initially trying to create in the initial prototype. BR: What is the story behind the game and its universe? DT: The player takes the role of a military strategist in the future preparing for the inevitable first contact with alien life. So the “game” really is a simulator and what you play are possible scenarios of a war against aliens. The military always prepare for the worst so the worst here is the extinction of the human race. So there’s no heavy focus on story but the various scenarios will show what could happen between first contact and the ultimate attack of Earth by aliens. Again, it’s really meant as a simulator. BR: The game almost plays out like a board game in how units move and fire on each other. Was that something you were striving for? DT: Absolutely. There are so many new space games being released these days that I wanted to come up with something that would offer a different experience. Something that turn-based strategy fans like me could enjoy. There are many great space games I’d like to check but I often pass because everything happens in real-time and often requires a bit too much involvement to become good at them. Between my day job and working on games I just like when I’m able to launch a game for 20 minutes, immediately have fun and then only return to it a week later without having to check back how everything work or keyboard shortcuts because I forgot it all. I’m sure people with a heavy schedule or kids can relate to that and I think that having the game work like a board game offers a lot to them. BR: In playing some of the scenarios in the early version, it looks like there are a variety of different ships with different abilities. What kind of ships are available to the player? DT: The number of ships and all the weapons are not yet completely defined but so far there are 5 categories: fighters, bombers, frigates, cruisers and transports. Beside the usual (lasers, missiles, rockets, etc.) I’m planning to add abilities that can influence the battle without necessarily dealing damages. A few examples of abilities I’m working on are beams to recharge shields of other ships, wormholes to relocate enemy spaceships on the map and hyperdrives! In some battles the map will be so big that engaging the hyperdrive will be required to get to the enemy in time. This also opens the door to managing multiple frontlines at the same time instead of always having a single battle with a single outcome. BR: How many different factions in the game, and what can you tell us about them? DT: The final number of factions is still not defined but there will be more than one alien race for sure. Each alien race will bring new move and weapons pattern so players don’t get too comfortable fighting the same enemies. Beside that I can probably tell you that seeing two races of aliens fight each others with humans in the middle is to be expected. BR: What can you tell us about the engine the game is running on? DT: The game is built with Starling which means that a Mac version will be available at the same time as the PC version. It also means that I could in theory easily port it to tablets but that’s way too ahead to talk about that and it’s not a priority. Sadly it also means no Linux version as Starling is using Adobe AIR which stopped supporting Linux at version 2.6 and Starling requires at least version 3. BR: What kind of gameplay options are available to the player? For example, will there be a scripted campaign, single scenarios and so on? DT: Two options will be available. The first one is what you experienced so scenarios grouped together as mini-campaigns. Campaigns will be in fact 4-5 scenario with the same theme (ex. : attack on a specific colony) that you need to play in order to unlock the next campaign. The other options will allow players to generate a random map for a quick (or longer) battle. Players will pick the size, difficulty and the ships they desire to appear in the map and these will be standalone battles. BR: Will the game be moddable at all, so players can make their own scenarios and so on? DT: Completely! All scenarios, ships, particles for engines and projectiles and sounds can be edited or new ones can be created. I’m also checking to allow players to edit explosions and impacts on shields. It is as simple as unzipping any file and edit its content in a text editor. I plan to provide some documentation on how to achieve this but I’m sure people will easily figure it out as the text files are clearly identified and don’t contain any obscure terms. BR: How far along is the game, and when do you think it will be ready? DT: The framework is about 90% completed but now I’m mostly dedicated to content creation which I’m just beginning. There’s still a lot of work to do but hopefully any code change will be to fix bugs or add new abilities. I don’t have a fix deadline to release the game but by best estimation so far would be this summer. BR: Finally, do you have any advice to people thinking about making their own game for the first time? DT: I’m careful about giving advice as I’m careful of advice I read on the Web but the best advice is probably also most simple: Start to work on a game you will release and then repeat the process. Getting to the release of a game is much more difficult than it might sound like so if you can do this a few times then something should happen at some point. Some make it on their first release but for the majority it takes a few tries to get anywhere.